There are all kinds of reasons to be concerned about succession planning today, and most do not revolve around the mass retirement of baby boomers. Fueled by the relentless evolution of technology and global competition, the business environment is changing more rapidly than ever before. To tackle upcoming crises, rebuild organizations, and create new business models, multiple skill and character sets will be required. This ExecBlueprint discusses how today’s CEOs can address these upcoming challenges. First, you must discern what type of leader will be necessary to lead through the next phase, and hire accordingly. You will need to continually assess your employees: Who shows leadership potential through their actions, skills, and expressed interests? Nurture these people, not only through formal development programs but also real-world exposure to different functions and problems. And remember: new circumstances will continue to arise and confound your process. As such, your leadership development process is never finished. The need for the right leader at the right time remains constant. 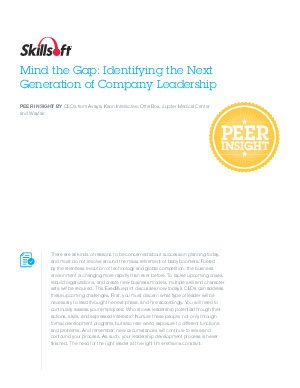 Download a complimentary paper, Mind the Gap: Identifying the Next Generation of Company Leadership and read how you can address upcoming leadership development challenges.